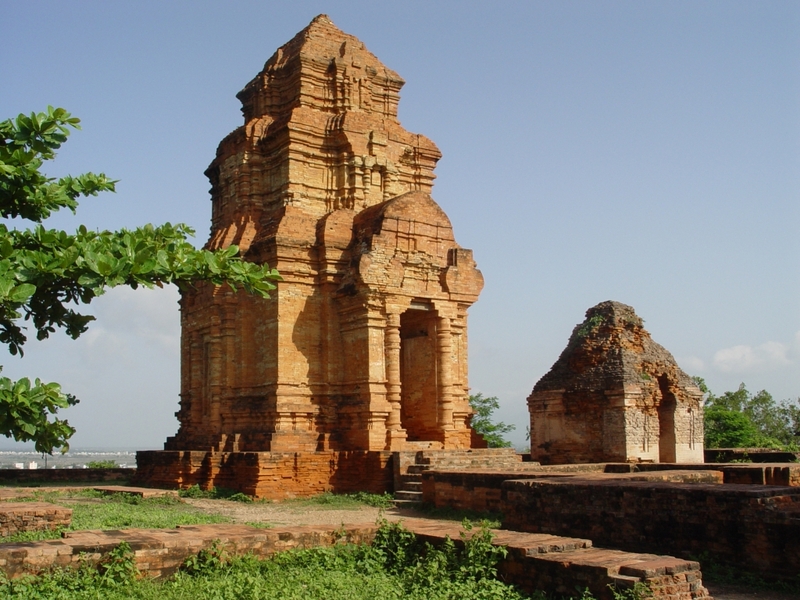 The former Cham capital of Cha Ban (also known as Vijay and Quy Nhon) was located 26km north of Quy Nhon and 5km from Binh Dinh. While of archaeological importance, there’s very little to see for the casual visitor. However, there are several interesting Cham structures dotted around the area. Cha Ban, which served as the capital of Champa from the year 1000 (after the loss of Indrapura/Dong Duong) until 1471, was attacked and plundered repeatedly by the Vietnamese, Khmers and Chinese. In 1044 the Vietnamese prince Phat Ma occupied the city and carried off a great deal of booty along with the Cham king’s wives, harem, female dancers, musicians and singers. Cha Ban was under the control of Jayavarman VII and the Khmer empire from 1190 to 1220. In 1377 the Vietnamese were defeated and their king was killed in an attempt to capture Cha Ban. The Vietnamese emperor Le Thanh Ton breached the eastern gate of the city in 1471 and captured the Cham king and 50 members of the royal family. During this, the last great battle fought by the Cham, 60,000 Cham were killed and 30,000 more were taken prisoner by the Vietnamese. During the Tay Son Rebellion, Cha Ban served as the capital of central Vietnam, and was ruled by the eldest of the three Tay Son brothers. It was attacked in 1793 by the forces of Nguyen Anh (later Emperor Gia Long), but the assault failed. In 1799 they laid siege to the city again, under the command of General Vu Tinh, capturing it at last. The Tay Son rebels soon reoccupied the port of Thi Nai (modern-day Quy Nhon) and then laid siege to Cha Ban themselves. The siege continued for over a year, and by June 1801, Vu Tinh’s provisions were gone. Food was in short supply; all the horses and elephants had long since been eaten. Refusing to consider the ignominy of surrender, Vu Tinh had an octagonal wooden tower constructed. He filled it with gunpowder and, arrayed in his ceremonial robes, went inside and blew himself up. Upon hearing the news of the death of his dedicated general, Nguyen Anh wept. The most impressive of the area’s Cham sites, this group of four towers sits atop a hill 20km to the north of Quy Nhon and is clearly visible from Hwy 1. The architecture of each tower is distinctly different, although all were built around the turn of the 12th century. The smaller, barrel-roofed tower has the most intricate carvings, although there’s still a wonderfully toothy face looking down on it from the wall of the largest tower. A large Buddhist pagoda sits on the side of the hill under the lowest of the towers. There are great views of the surrounding countryside from the top of the hill. The towers (Phuoc Hiep, Tuy Phuoc district; 7-11am & 1.30-4.30pm) are easily reached by taking Ð Tran Hung Dao out of Quy Nhon for about 30 minutes, when you’ll see the towers in the distance to the right of the road. After the traffic lights joining the main highway, cross the bridge and turn right. Take the left turn heading up the hill to reach the entrance. These towers (Binh Hoa, Tay Son district; 7-11am & 1.30-4.30pm) are harder to find, sitting in the countryside about 50km northwest of Quy Nhon. Dating from the late 12th century, the largest of the three brick towers (24m high) is embellished with granite ornamentation representing naga (a mythical serpent being with divine powers) and elephants (Duong Long means ‘Towers of Ivory’). Over the doors are bas-reliefs of women, dancers, monsters and various animals. The corners of the structure are formed by enormous dragon heads. It is best to visit the towers with a driver or a tour, as the site is reached by a succession of pretty country lanes through rice paddies and over rickety bridges.